As I mentioned in my last post, one of the remaining issues is that the Lenovo X220’s wifi card isn’t recognised by Mac OS X. 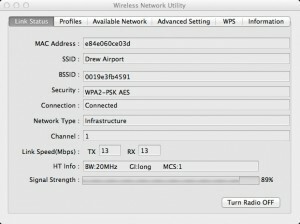 One of the ways around this is to replace the wifi card with one that’s recognised by OS X, and this is the path most take, as the new card only costs about $15, and works seamlessly with the computer. 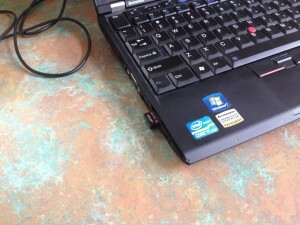 I didn’t want to do this though, since the laptop belongs to my employer. I didn’t want to open up the case and break the warranty. 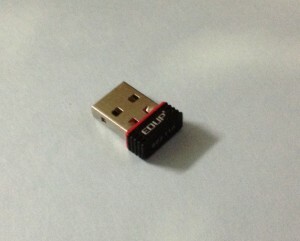 Instead, I went to ebay, and bought the smallest USB wifi dongle I could. It was a Edup RTL8192C 802.11n dongle. It’s remarkable the miniaturisation that they’ve been able to do for this card. The fact that they could pack the electronics and an aerial into this tiny package is amazing. It’s only 150N networking, and the range isn’t great, but that’s to be expected. Naturally, the drivers that came with the dongle don’t include Mac drivers. It took a bit of hunting to find some, but I eventually found them. I’ve included them below in case anyone finds this page when looking for drivers. 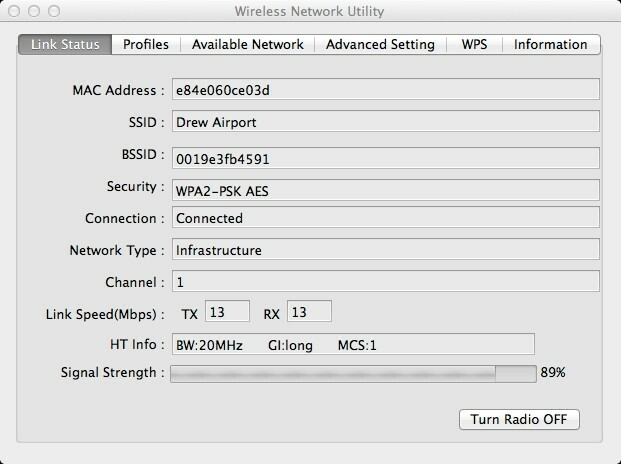 An interesting side-effect is that the wireless dongle also works in Windows, so you can connect to two wireless networks simultaneously. This entry was posted in computing and tagged hackintosh, wifi on February 17, 2013 by David.